This week (20-26 June 2016) is #celebratebreastfeeding week. 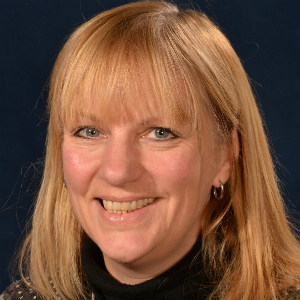 Next week PHE will be publishing a toolkit for local authorities to support them in promoting and improving breast feeding in their communities but if we urge you to read this blog that was published last year. The overwhelming evidence tells us that breast feeding provides the best nutrition for babies. In fact, it’s a national priority recognised within Public Health England’s commitment to ensuring every child has the best start in life; and is the focus of one of the six public health priorities described in the High Impact Areas for Early Years; breastfeeding is High Impact Area 3. We know breastfeeding has significant health benefits for both the mother and child; the truth of the matter is that breastfeeding is one of the best things a mother can do for her baby’s health and for her own health. It is the normal, natural way to feed a baby. Breastfeeding ensures babies nutritional needs are met, encourages optimum development, resistance to infection and helps to create a close and loving bond between mother and child. Breastfeeding for 3 months in the first year of a baby’s life reduces the risk of childhood asthma by 27%, type 1 diabetes by 23% and childhood obesity by 7%. Breastfeeding for 6 months reduces the risk of lower respiratory tract infections by 72% and gastroenteritis by 64%. And 4-6 months of exclusive breastfeeding reduces the risk of sudden unexpected death in infancy is reduced by 36%. In addition to this, mothers who breastfeed benefit from a faster return to pre-pregnancy weight and possibly, a lower risk of breast and ovarian cancer. And best of all its free, so will help every child no matter what their background get a healthy start in life. 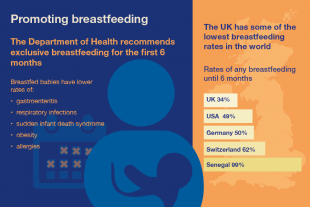 Despite this, breastfeeding rates in the UK are among the lowest in Europe with around 74% of mother’s breastfeeding at birth, dropping to 47% at 6-8 weeks. Nearly all women can breastfeed successfully, but almost everyone needs support when they are starting out; it is a skill that both mother and baby need to learn together. The emphasis of High Impact Area 3 is the key role Health Visitors play in supporting breastfeeding. They are not only well positioned to support mothers with practical help and advice on how to breastfeed, but they can also ensure a whole system approach to promoting breastfeeding by leading on the implementation and delivery of evidence based public health programmes such as the UNICEF Baby Friendly Initiative and peer support programmes in the locality.